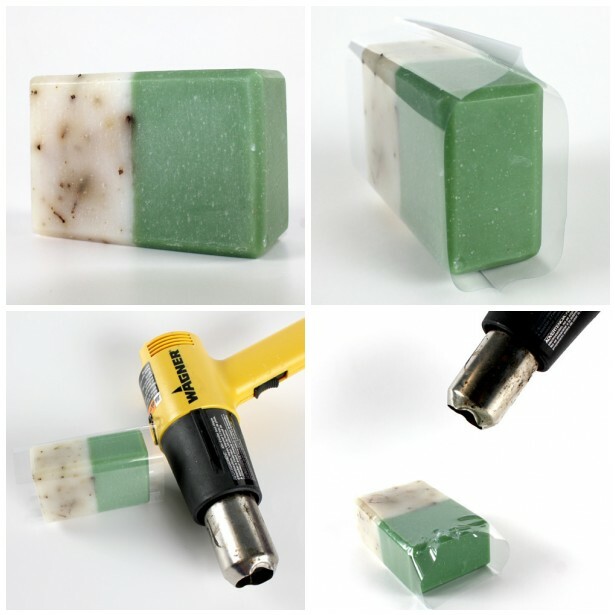 With simple-to-use shrink wrap soap bands, you can easily provide a professional finish for your soap without investing in a heat tunnel. Our Shrink Wrap bands shrink down with the application of heat from a heat gun. Although a hair dryer will work, it won’t achieve the smooth, fully shrunken wrap results. Best of all, these shrink wrap bands have a perforated easy-open strip for ease of use when your customer gets their soap home. Directions: Slide the soap into the shrink wrap so the perforated plastic is on the long edge of the soap (the part that you would tear to open). I like to start on on the front side of the soap. Apply the heat until it starts to shrink. It may look funny at first but once you apply heat to all of the sides and ends you’ll see it starting to come together. I like to do the ends last for the finishing touch. Dimensions: 3 15/16″ x 3 7/16″ (opens on this side). Tear strip runs the 3 15/16″ length. Tip: If you have small soap, just cut the Shrink Wrap Band in half to fit smaller bars easily. We like to do this for sample soaps. Voila! Professionally wrapped bar of Rosemary Cold Process Soap. It’s super easy to do and the soap looks super professional to boot. Is there any way to do this with bath bombs? Or is there another way you suggest to wrap them instead? Thanks! I use regular cellophane from the craft store to wrap my m&p soaps. I was worried about melting with the shrink wrap and you need a heat gun.. So far the cellophane has worked fine, you just need a sharp scissor, but can cut pieces to size. I get comments at shows on how nice they look. I have a tray of half wrapped labeled soaps as scent testers. Between shows, I store the wrapped soaps in zip lock bags. Was just wondering if anyone else does this, and will using the cellophane damage the soaps in any way? Thanks for your reply. I agree about the drag marks, but this only seems to happen occasionally on very raised designs rather than the flatter bars. So I try not to handle these much. I like the versatility of being able to cut to size. I also wrap them tightly so there’s not much movement and seal with mailing tape. Living in Nevada helps, its dry as a bone here! I’ll try to get some photos on the Brambleberry FB page. Thanks again, and this blog is so helpful! When I seal my M&P soap with plastic wrap, I find that overtime the plastic wrap loosens and wrinkles up. So repackaging is a must. Can I use the Brambleberry Shrink Wrap bands on M&P soap, if it is completely closed on all sides? Thanks Becky, will keep you updated. I like the convenience of shopping and getting everything from Brambleberry. Please put in a request for shrink wrap tubing, this way we can cut to length. Thanks for the suggestion, I will definitely pass it onto our Product Development Team. If you get any pictures of your soapy packaging, we’d love to see how it turned out. You can share photos with us on Bramble Berry’s Facebook page. The shrink wrap bands are 10 centimeters by 8.73 centimeters and are perfect to wrap your cold process soaps in. I have read that it is not good to wrap or seal cp soaps in plastic. However, my bars are textured on top and I have been using Costco’s plastic wrap as it really clings and works great for me. Am I creating an issue that is harmful to my soap? Also, after how many weeks is it ok to package the soap? Would these bands fit around soaps made with Brambleberry’s Vertical mold? I just double checked and it looks like the dimensions are correct online. 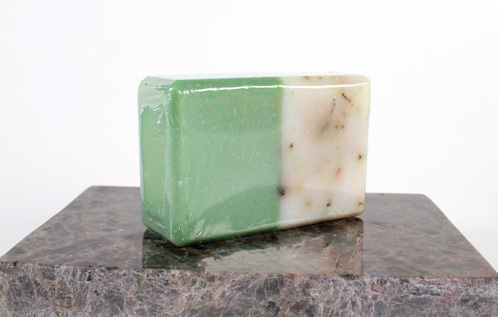 They do fit soap made in the vertical mold, but the thickness of the bar does matter. I wonder if this is the issue? For instance, The Cherry Blossom Vertical Mold color block soap (blog tutorial – so cute!) was cut with the multi-bar cutter. These bars are too thick to fit the shrink wrap bands, even after curing for 3-4 months. Hi there! What is the best way to wrap M&P soap of all different shapes, can you help me? Thanks! Exactly what I need to wrap my cp soap. Can you use the bands successfully with M & P soaps or do they need to be fully sealed? I’m pretty sure you want to fully wrap MP soap. Otherwise, you could get moisture beads accumulating on the soap. Thanks everyone. I thought that was the case but you never know for sure unless you ask!